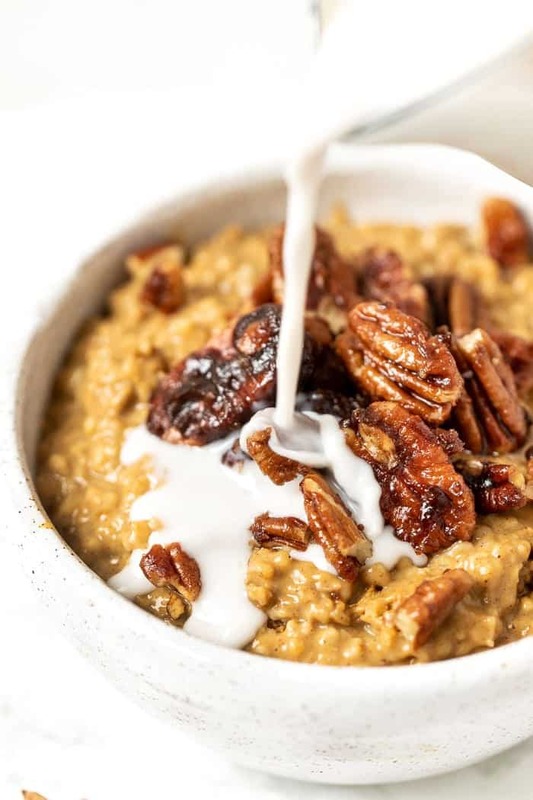 Pumpkin steel cut oats with a super creamy texture! These are the perfect fall breakfast, taste like pumpkin pie and are such a great way to start your day! I think Fall is my favorite season. I say that every year about Spring, Summer and Fall, but there's just so much to love about this time of year. Not only are the leaves changing, the weather is cooling down, but the food. Oh, the food! 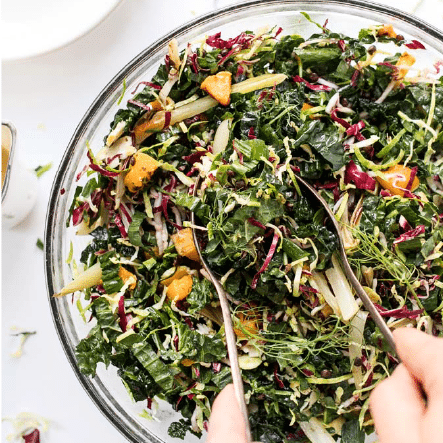 Winter squashes are popping up the shelves at the markets, brussels sprouts, apples, and root veggies are making their way into my meals. And of course, the best of it all: PUMPKIN! Pumpkin is often synonymous with baked goods, but today we're turning it into the most glorious breakfast treat! 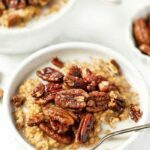 These pumpkin steel cut oats are creamy, sweet and topped with some caramelized pecans to make them extra special! 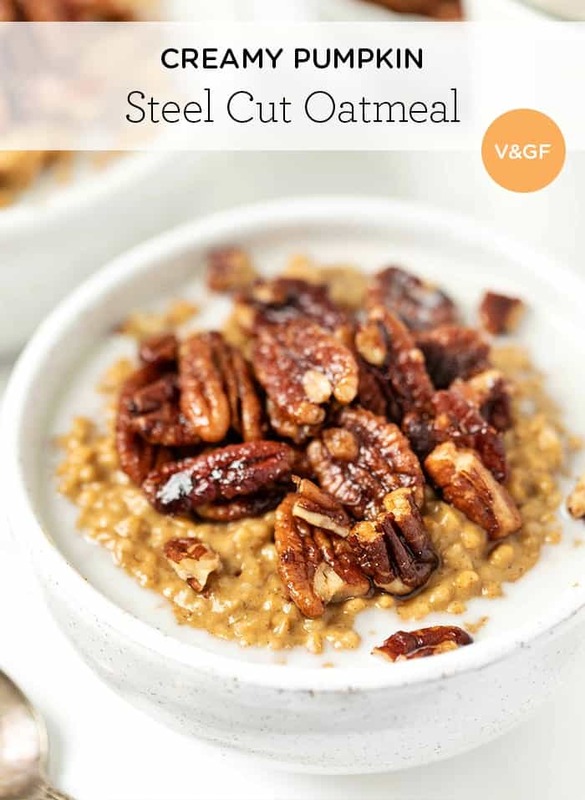 Steel cut oats are made from whole oat groats that have been chopped into pieces using a steel mill. That means because the pieces are bigger, they take longer to cook and have a chewier texture. 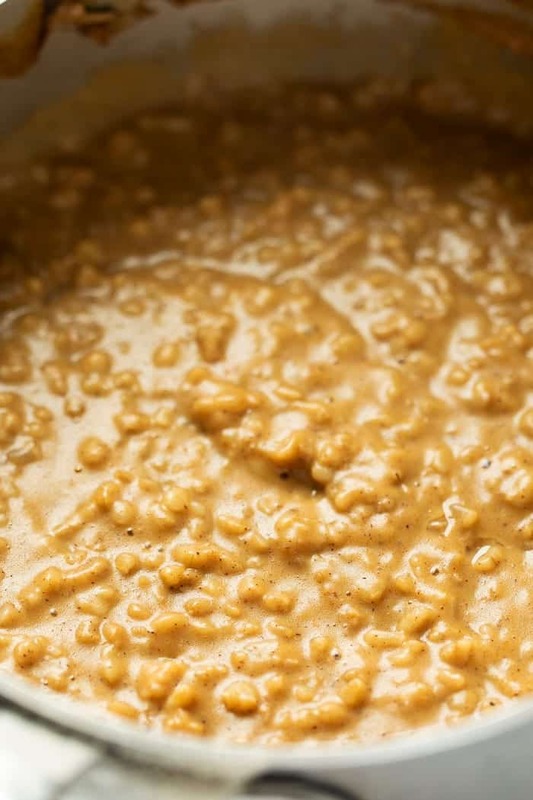 To make steel cut oats, you basically just need to simmer them on low heat for about 30 minutes. You can cook them like you would regular oatmeal (with water), but to get them super creamy, I like to cook my steel cut oats with almond milk and a little fat. 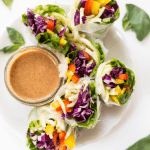 The almond milk adds a touch of flavor and natural sweetness and the fat (usually vegan butter or coconut butter) makes it silky smooth and creamy. For this batch, since we're making them pumpkin pie inspired, we stir in some pumpkin puree, a touch of coconut sugar and some pumpkin pie spice! I like to give my oatmeal bowls a little extra flare. Remember when we made that batch of creamy steel cut oats with caramelized bananas on top? We're using that as inspiration and whipping up some amazing caramelized pecans without any cane sugar! Making caramel is actually quite simple: you just have to boil down sugar and water until it turns into a thick caramel. Since we're not using cane sugar, I've found a way to make caramelized things even simpler. All I do is sautee the ingredient (in this case pecans) with some coconut oil and sugar of my choice. 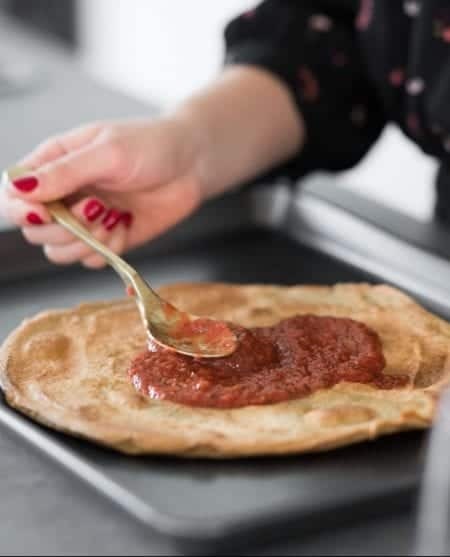 I find this method works best with a liquid sweetener like maple syrup or honey, but you can also use coconut sugar which is what we're doing here. 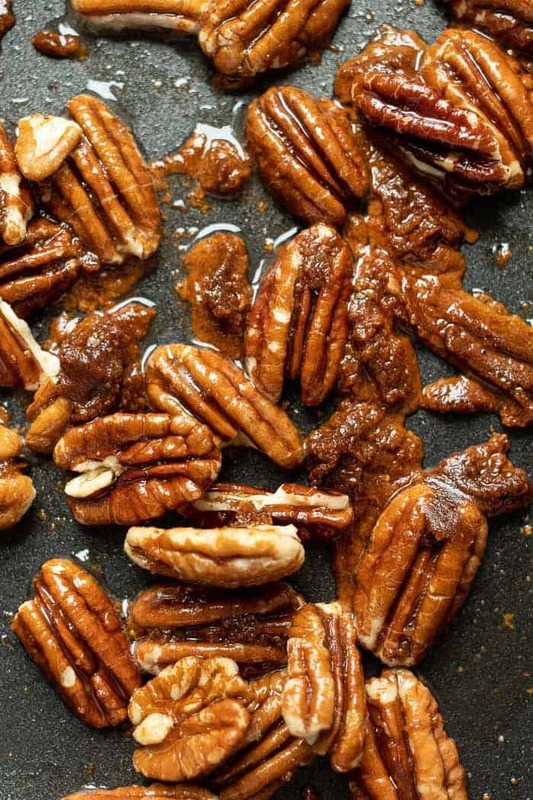 After about 3 minutes of cooking, you'll have gorgeously caramelized pecans! The flavor combination here is everything. We've got the classic pumpkin (which doesn't actually have that much flavor), combined with pumpkin pie spice, a touch of sugar and topped with the sweetness from the pecans and a creaminess from the splash of almond milk. But we also have the ultimate texture combo too! The oats are creamy, but also chewy at the same time. 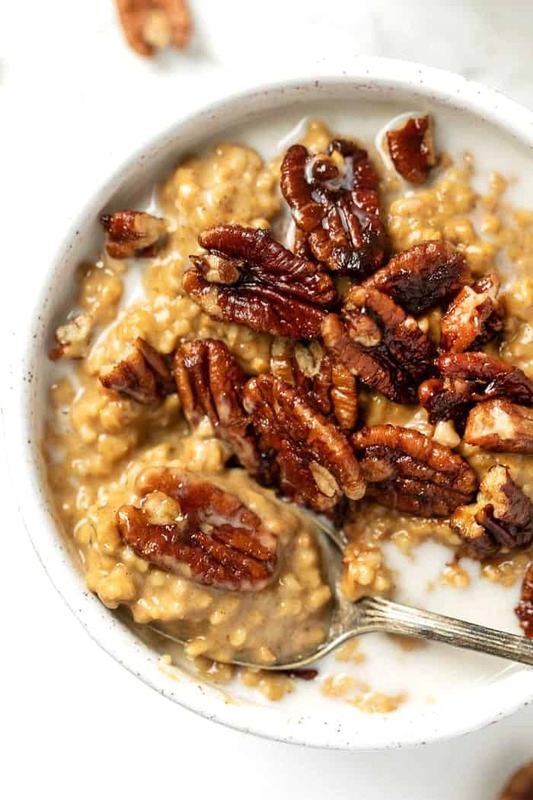 Not like standard oatmeal or quinoa flakes that can turn into mush, these steel cut oats hold their texture and add interest to each bite. Then we also have the crunchiness from the pecans and a coolness from the milk that balances everything out. To make this really perfect? Stir everything together and enjoy! One of the things I love about steel cut oats is that you can make them ahead and reheat them! Since they've got that heartier texture, they can be refrigerated and reheated without any issue. I like to store mine in the fridge, the scoop out what I want into a bowl, top it with some almond milk and give it a quick reheat in the microwave. It's still super creamy, super flavorful and makes having a healthy breakfast a total breeze. Have you ever meal prepped oats before? 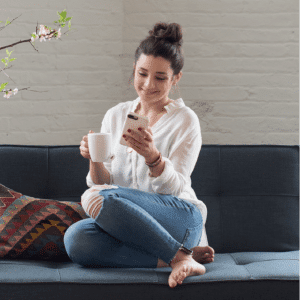 I gotta say…it's a game changer! 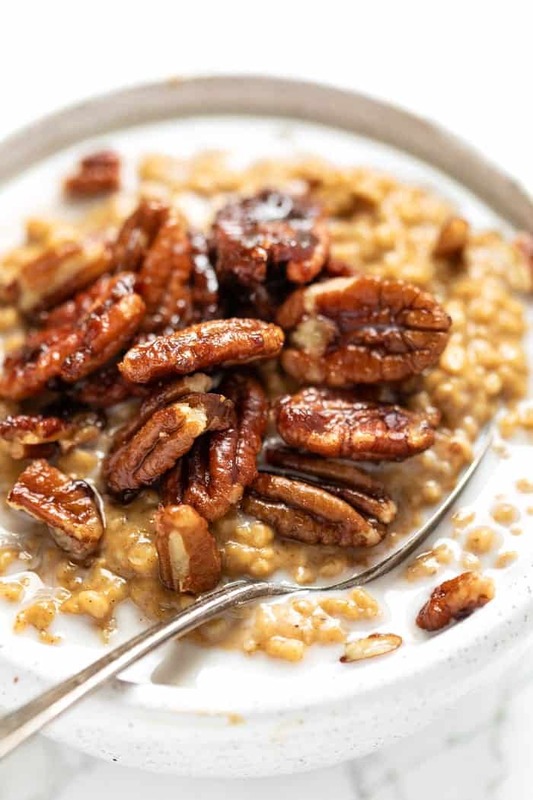 These healthy pumpkin steel cut oats are the perfect fall breakfast. They're creamy, taste like pumpkin pie and are such a great way to start your day! Add oats and almond milk to a small saucepan and bring to a boil. Stir in pumpkin, butter, 2 tablespoons of sugar, pumpkin spice and salt. Reduce to low and simmer for 25 - 30 minutes, stirring occasionally. For the pecans, add the coconut oil and remaining sugar to a large saute pan. Once melted and shimmering, add the pecans. Cook for 3 minutes until caramelized. Remove from heat and plate the oatmeal. To serve, divide the oatmeal evenly between bowls. 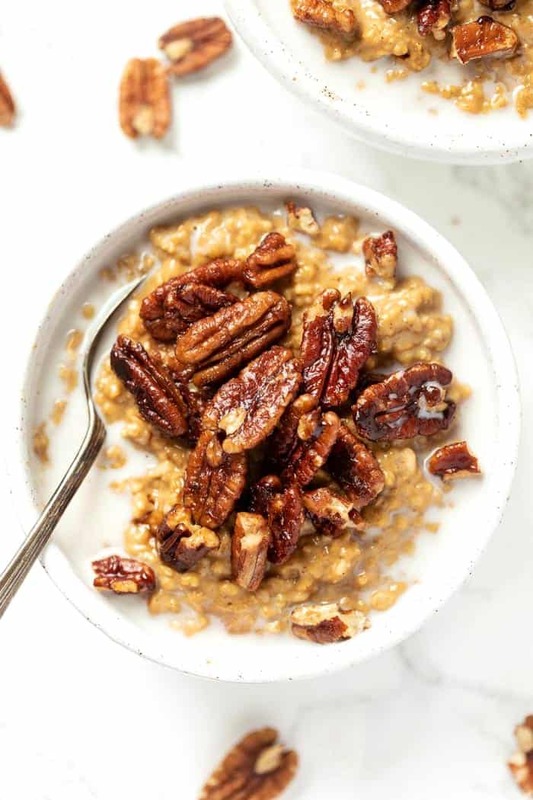 Top each bowl with some pecans and a drizzle of almond milk and enjoy! I am loving your site. The nutrition facts is super helpful! I’ve got my oats already soaking for this recipe in the morning and I’m so excited!